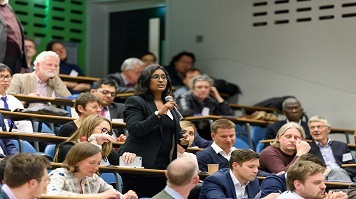 This year's popular CIBSE conference gave voice to a range of expert guest speakers from across industry and academia - including LSBU. Students, academics and engineers delivered presentations on the themes of energy efficiency and designing a more sustainable built environment for cities of the future. LSBU's Lecturer in Construction Apprenticeships, Carlos Gonzalo, pitched his timely and topical technical proposal for improving the fire resistance of cladding panels on buildings. LSBU’s Acoustics expert, Dr Stephen Dance, presented a feasibility study for the increasingly popular use of urban wind turbines on the roof of hospitals, tall buildings and residential developments. Twice daily, Professor Andy Ford, LSBU’s Director of Enterprise and Innovation, and Professor of Building Services Engineering, took delegates on a tour of the University campus to show them how his research is helping to manage heat and energy levels efficiently in the various buildings on site. Among the external speakers, Phil Jones, Chair of CIBSE’s CHP district heating group, discussed harnessing renewable energy from rivers and canals to provide low carbon heat to buildings and Sharon Duffy of Transport for London outlined the work being undertaken to overcome the challenges posed by using waste heat from London’s transport systems. Speaking at the conference, Hywel Davies, CIBSE’s Technical Director said: “This year’s conference has proved to be more popular than ever before. We achieved record attendance levels and record numbers of presentations, which is good to see. “It’s clear, from the range of presentations given, that industry is going to have to do things differently in future if we’re going to meet the Carbon reduction targets we’ve been set by government for 2050. Professor Charles Egbu, Dean of LSBU’s School of Architecture and the Built Environment (BEA) said: “With 2018 being the UK’s Year of Engineering, the inspiring projects being talked about at this year’s conference, should help persuade our young engineers to stay in the profession and convince them their ideas are needed now, more than ever. Read the full programme for CIBSE’s Technical Symposium 2018.